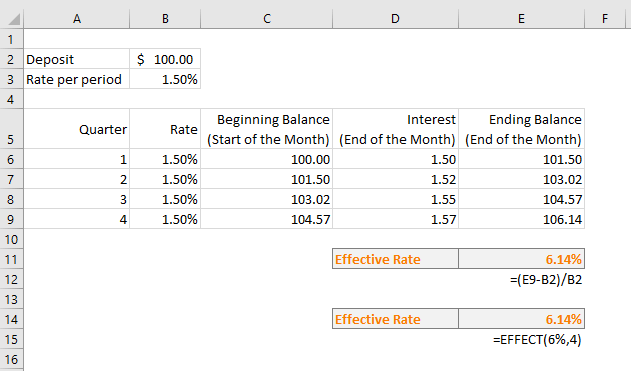 How to calculate compound interest for recurring deposit in Excel! 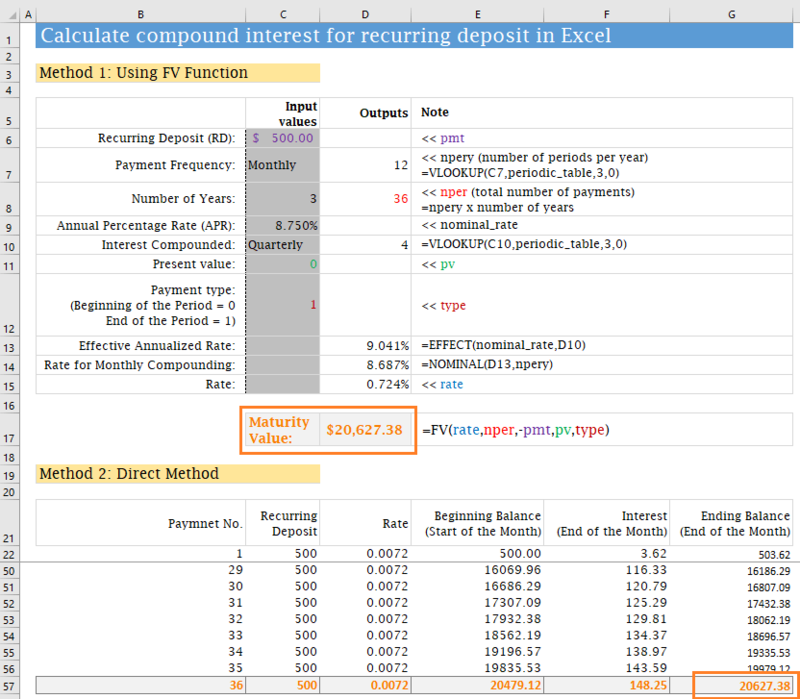 In this short tutorial, I will show how to calculate compound interest (maturity value) for recurring deposit in Excel. For some people, saving is tough. For these types of people, making a recurring deposit every month to their saving account and getting a good amount after some years is a good option. This Recurring Deposit (RD) is a popular saving scheme in the Indian sub-continent. I am from Bangladesh and recurring deposit (RD) is a very popular scheme in my country, too. 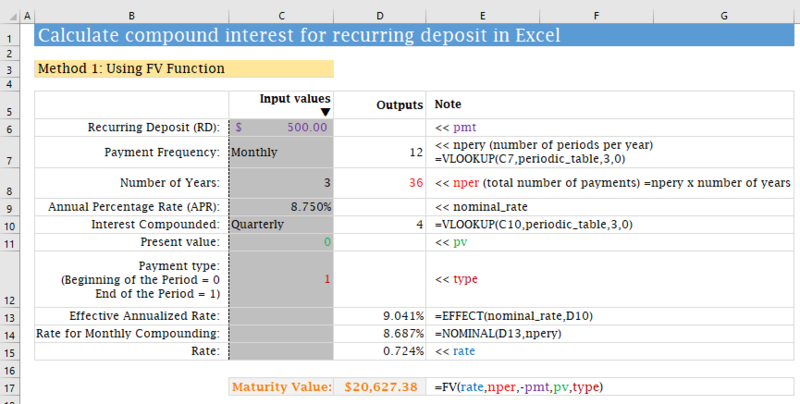 Let me now show you how you can calculate your maturity value of the recurring deposits in Excel. It is a good practice to know how the whole thing works of your investment. Never be in the dark when this is about your personal finance. Download the Excel template that I have made while I was writing this article. Excel has made our life very easier. 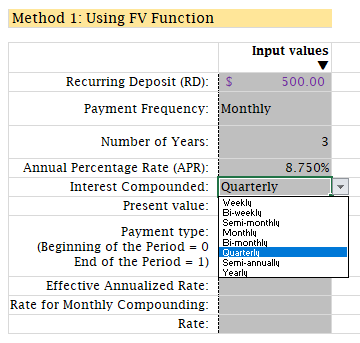 Using Excel’s FV function, you can easily calculate the Maturity Value (Future Value) of your recurring deposit for any periods. Complexity arises when you make deposits monthly but the Bank compounds your money quarterly or in different periods. Don’t worry. I will make things easier for you. I will explain the whole calculation step by step. FV function returns the future value of an investment based on periodic, constant payments and a constant interest rate. type: Type of payment. Payments can be of two types: Beginning of the period (1) and End of the period (omitted or 0). EFFECT function returns the effective annual interest rate. For example, your bank provides the Nominal Interest Rate is 6% per annum. Now you make a deposit of amount $100 with a bank for the next 1 year and the bank compounds your money quarterly. What will be your effective rate or return? Your Rate per Quarter is: 6%/4 = 1.50%. This is because your money is compounded 4 times per year. So, nominal interest is divided by 4 to get the Rate per Quarter. At the end of the first quarter, your ending balance will be $101.50. 1.50% interest is applied to the Beginning Balance $100. Your nominal interest rate is 6%. But because of 4 compounding per year, you’re getting a 6.14% return on your investment. This is shown also in the image. The NOMINAL function is the opposite of the EFFECT function. It returns the Nominal Interest Rate from an Effective Interest Rate. The following image shows the whole process that I have used to calculate the recurring deposit. In this method, I have used the FV function. Recurring Deposit (RD): The amount you will deposit every month (or any period). We named this cell pmt. Payment Frequency: It is a drop-down list. In most cases, it is monthly. But you can select any period from the drop-down. On the right, we have also calculated the number of periods per year (npery) using Excel’s VLOOKUP function: =VLOOKUP(C7,periodic_table,3,0). You will get the periodic_table in the Tables worksheet. I have shown the periodic_table in the following table. Number of Years: Total number of years you will keep depositing your fund. On the right, we get the total number of periods (nper) multiplying the Number of Years by the Number of Periods per Year (npery). Annual Percentage Rate (APR): This is the nominal interest rate your bank offers to you. Interest Compounded: Indian Banks compound your investment quarterly. It can differ from bank to bank. This is also a drop-down list. So, you can choose any compounding frequency. Just remember that your Interest Compounding Frequency must be equal to or greater than the Payment Frequency. For example, if your Payment Frequency is Monthly, you cannot choose the Compounding Frequency value as Weekly, Bi-weekly or Semi-monthly. 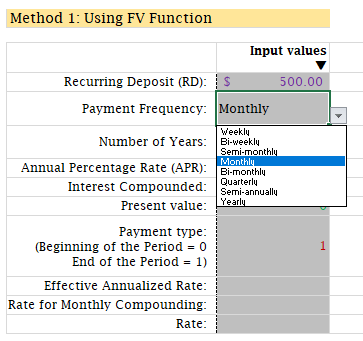 Then you will input the Present Value, and Payment Type (either 0 or 1). Our Recurring Deposit is made Monthly but our compounding frequency is Quarterly (or any). So how will we handle this situation? Now we need a nominal rate that will give us the same effective rate with Monthly compounding: =NOMINAL(9.041%,12) = 8.687%. You can cross check it this way: whether this nominal rate (8.687%) will provide the same effective rate with monthly compounding: =EFFECT(8.687%,12) = 041%. Same. Now we need the rate for a period (monthly) and it is 687%/12 = 0.724%. This is a step by step calculation to get the Maturity Value of your Recurring Deposit (RD) for 36 periods (3 years). We have used the same pmt value, the same rate per period here. But the procedure is direct. Let me explain. This is how the table advances. To add more periods in this table, just copy the last row to your desired level. If you have followed this article step by step, you have learned a very important lesson. 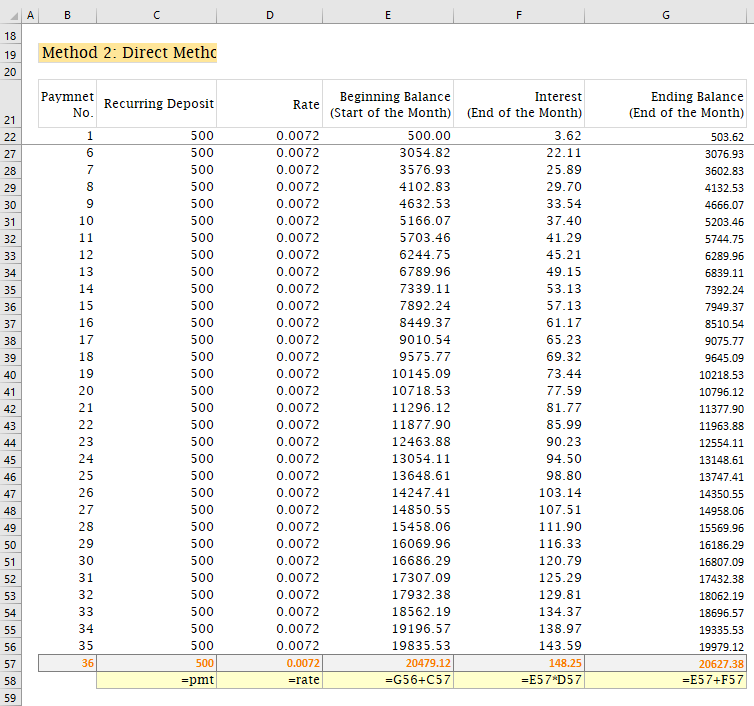 Before using Excel, I struggled a lot to calculate even my wife’s recurring deposits and its Maturity Value. Now it is simple to me. 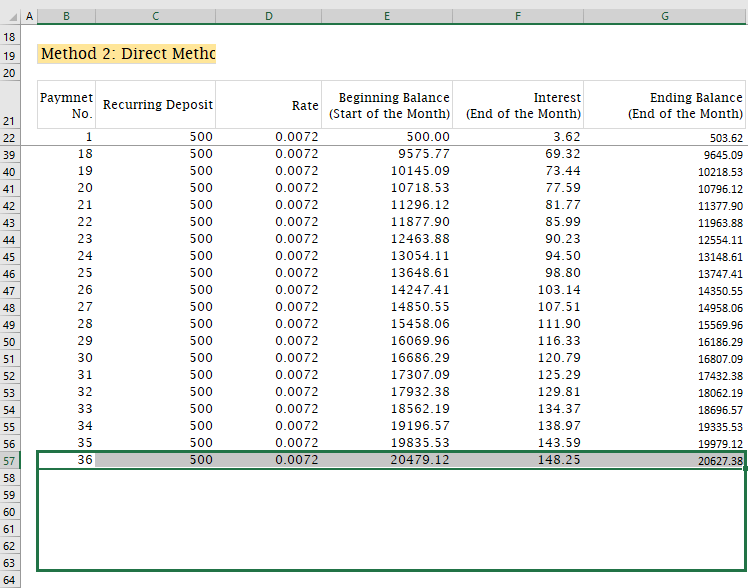 So, this is my way of calculating interest for recurring deposit in Excel. What is your feedback with this article? Was it useful? Did you face any problem using my calculator? Let me know in the comment box.